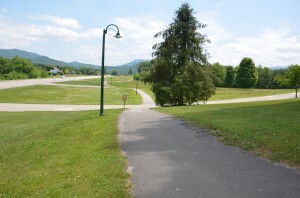 The Townsend Visitor Center has a page on their website of seven bike routes. Two of them are shown on this map, the Cades Cove Loop Road and the Townsend Bike Trail. Both have visitor centers on them with restroom facilities. In season, you can rent bikes at the beginning of the Cove and on Wednesdays and Saturdays till 10AM the Cove is only open to bicyclists and pedestrians. I’ve also marked I.C. King Park on the map, which has off road mountain biking. It is not for beginners, and some technical skill is required. You are welcome to store your bikes in our garage while you are out doing other sightseeing.